You used to have to go to the deli to get a roast beef sandwich like this. Now you can make it at home with a can of refrigerated pizza crust! Preheat oven to 400°F. Spray 15x10x1-inch baking pan with cooking spray. Place pizza dough in pan; pat out with fingers to completely cover bottom of pan. Arrange meat slices, in lengthwise row, down center of dough; top with onions, peppers, potatoes and cheese. Fold over long sides of dough to cover filling, slightly overlapping edges of dough in center. Pinch ends of dough together to seal. Bake 15 to 20 min. or until golden brown. Remove from baking pan; let stand 5 min. before cutting into 6 slices to serve. Prepare and bake as directed. Cool slightly, then wrap tightly and refrigerate until ready to serve. No need to reheat before serving. Or to warm up before serving, microwave each slice on HIGH 30 sec. or heat in 350°F-toaster oven for 2 min. or just until warmed. 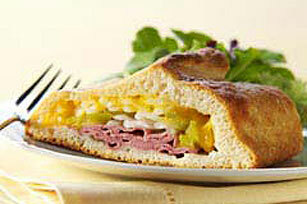 Serve this hot sandwich with a tossed green salad and fresh fruit salad. Prepare as directed, cutting each slice lengthwise in half. Makes 12 appetizer servings, 1 slice each.